Nelson Morris grew up on a dairy farm in Ashtabula County, Ohio. While in high school he attended the Cleveland Institute of Art and then the Pennsylvania Academy of the Fine Arts after graduation. Nelson taught classes and did mural programs in North Philadelphia prior to returning to Ohio. He established an art studio in Geauga County where he did independent art and photography. While obtaining his BA in Art Education through Kent State, Nelson worked in several facilities including a Juvenile detention center where he did mural work with students, and a group home for children where he acted as a supervisor. Nelson truly feels at home in a classroom and feels that it is a high honor to have the opportunity to teach at any level. He feels that CCDS is a great school because of our talented student body as well as the STEAM program. Nelson believes that art making is universal and that it can help all students through personal expression, empowerment, and the abstract thinking we employ when creating artwork. He also believes art, science, and math, is all deeply rooted together and that making connections between these subjects strengthens subject understanding. Nelson enjoys every moment of teaching. In his free time, Nelson still does freelance art and regularly shows at various galleries. 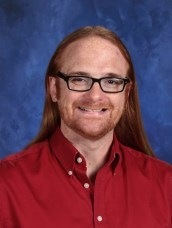 When not teaching or art making, Nelson also enjoys acro-yoga, martial arts, and long distance bicycle riding.